Afghanistan: Crossroads of the Ancient World will highlight some of the most important archaeological discoveries from ancient Afghanistan and will display precious and unique pieces on loan from the National Museum of Afghanistan in Kabul currently undergoing reconstruction. The geographical position, overland connections and history ensured that it was a region which enjoyed close relations with its neighbours in Central Asia, Iran, India and China, as well as more distant cultures stretching as far as the Mediterranean. Bank of America Merrill Lynch is supporting this unique opportunity to see rare treasures of Afghanistan’s cultural heritage in the UK. 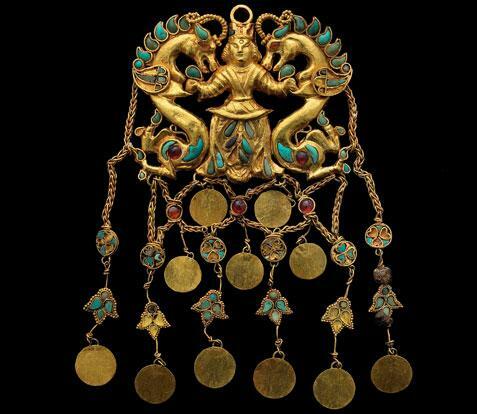 The exhibition will showcase over 200 stunning objects belonging to the National Museum of Afghanistan, accompanied by selected items from the British Museum. The artefacts range from Classical sculptures, polychrome ivory inlays originally attached to imported Indian furniture, enamelled Roman glass and polished stone tableware brought from Egypt, to delicate inlaid gold personal ornaments worn by the nomadic elite. Together they showcase the trading and cultural connections of Afghanistan and how it benefited from being on an important crossroads of the ancient world. 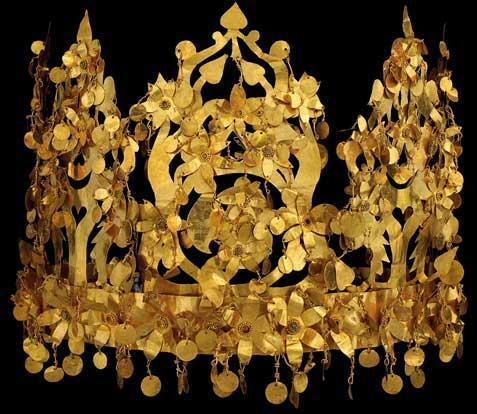 This astonishing object was found in the tomb of a nomadic woman. It was designed and assembled from different pieces which allowed it to be folded when not in use. It is the ultimate example of portable nomadic wealth. 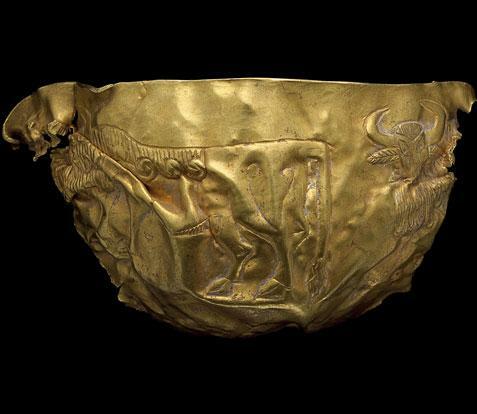 This fragment was part of a large group of gold and silver vessels found at Tepe Fullol in northern Afghanistan. Its discovery in 1965 suddenly revealed new evidence for the early antiquity of the region. The design on it resembles that of bulls shown in ancient Mesopotamian art – the two regions were connected by trade. Ai Khanum is the modern name of a Hellenistic Greek city built on the banks of the river Oxus (Amu darya) in the 3rd and 2nd centuries BC. Extensively excavated by French archaeologists in the 1960s and 1970s, it gives an almost complete city plan. The architecture is a combination of local tradition and imported Classical styles. 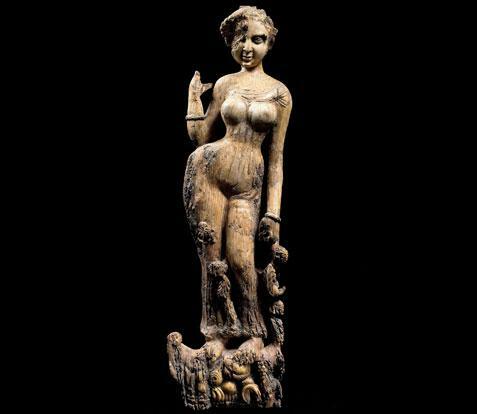 This was made in Roman Egypt and exported by sea via the Red Sea and Indian Ocean to India. It was then brought overland to Begram which was the summer capital of the Kushan Kingdom. It was found in a storeroom at the heart of a palace. The decoration shows a scene of people harvesting dates. 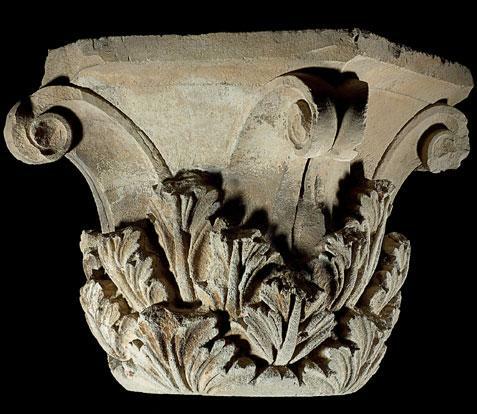 A large number of heavily decorated pieces of furniture were found in the palace storerooms at Begram. The wood had disintegrated but the ivory and bone inlays survived. These were originally heavily painted. The style of carving suggests they were imported from India. This is one of a pair of identical pendants found in a tomb. It shows a figure subduing a pair of mythical beasts. 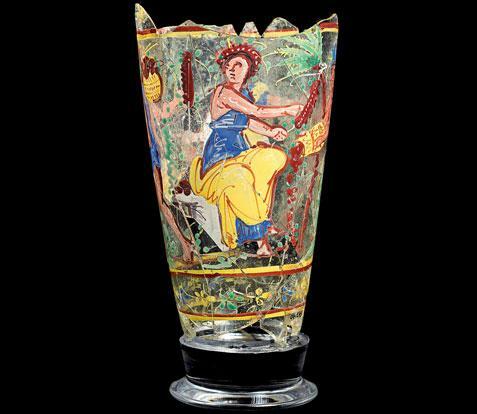 It is heavily inlaid with different coloured materials, including turquoise, garnet, lapis lazuli, carnelian, and pearl, some of which are long-distance imports. This underlines the position of Afghanistan on the crossroads of the world.